Just like America has great rivalries like Budweiser vs Miller Light, Italy has our own (a bit more substantial) food rivalry’s and unwritten blasphemies. One of the most infamous is guanciale vs pancetta. So much so that this centuries old tradition has crossed over into meme culture with popular memes bashing either choice. We’d like to settle this once and for all with our recipes at Due’ Cucina: guanciale is the right answer. First of all, you may be wondering, what is guanciale? Most Americans have probably heard of Pancetta, which is essentially pork belly that is salt and pepper cured. Very few have heard of guanciale. 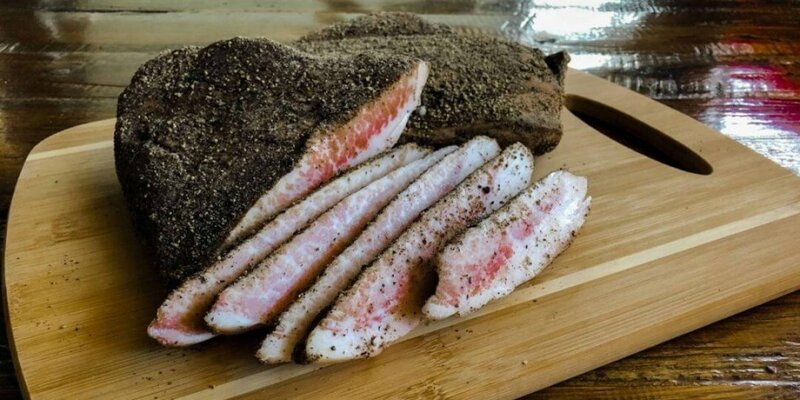 Guanciale is the pork jowl (cheek) cured in a mix of salt and spices. The differences are slight but they’re definitely there. Guanciale is a speciality of central Italy (not surprisingly, close to where we’re from). To make guanciale, we rub the pork cheek in a mix of salt and spices and cured for one week. Then we dry cure it for a minimum of 6 weeks. The flavor comes out much stronger than Pancetta and it has a softer texture. When cooked into traditional sauces, the fat melts away revealing strong, deep flavors that completely transform the sauce. It’s a small detail, but an Italian that knows what true traditional flavor is will know the difference and why guanciale is the choice over pancetta. Some typical sauces and dishes you may see guanciale in Carbonara and Amatriciana sauces. At Due’ we use guanciale in our Amatriciana this way, following the Roman tradition. We even take it a step further. We source the pork locally from Washington organic farms, spice, and cure the meat in house to make sure we get the authentic Roman flavor for our dishes. We’ve also introduced another very traditional way of using guanciale: in our Cacio&Pepe. Normally this dish is meatless but with the addition of guanciale to create “Gricia” or a variation of Cacio&Pepe with that rich flavor of guanciale. This dish is popular and native to the area around Rome. Next time you’re in, try one of our dishes featuring guanciale and be certain, you’re eating Italian done the real way!